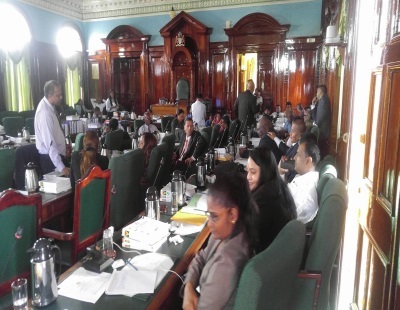 GEORGETOWN, Guyana, Dec 11, CMC – Guyana and opposition legislators Monday differed on the position adopted by the Speaker of Parliament, Dr. Barton Scotland, to suspend the sitting until his orders are followed after an opposition legislator refused to leave the Chamber. Bishop Juan Edghill, a member of the main opposition people’s Progressive Party (PPP) refused to leave the Chamber even after the Speaker had ordered the Sergeant at Arms to eject him from the session. “I will not be leaving”, Edghill shouted forcing Scotland to suspend the sitting until his orders are followed, and as police officers moved to have the opposition ejected from the building, fellow legislators formed a human circle around their colleague making it clear that they were not going to allow him to be forced to leave the Chamber. The Speaker had earlier indicated that he was sticking to the agreed timeframe for the examination of the budget for the Ministry of the Presidency. Legislators had been told that two hours had set aside for the exercise but when the time elapsed Edghill rose to his feet and demanded that more time be provided for the scrutiny of the Ministry of the Presidency’s estimates. The Speaker reminded the National Assembly of the earlier agreement but Edghill kept demanding that he be allowed more time even as he was repeatedly asked to take his seat. With the opposition legislator refusing to leave the parliamentary Chambers, the lights, air condition and the wifi services were turned off. Minister of State Harmon Joseph later told reporters that all legislators had to abide by the ruling of the Speaker regardless of their personal position on any issue. “It is not a matter between the Speaker and the MP. 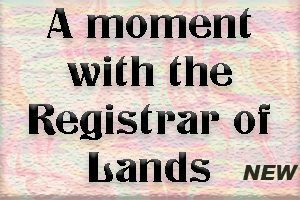 It is a matter of what is the lawful position. The Member of Parliament took a certain position, the Speaker made a ruling after several warnings to him (and) even after the Speaker gave his ruling the Speaker told him to leave the Chambers and all of you heard him say I will not leave in complete defiance of what the Speaker said”. Joseph said that the situation is about “the rule of law,” telling reporters “the Speaker is the person who controls the business in this House and Mr. Edgill or no other member of the House can decide they can violate these rules of the House by refusing to take action when the Speaker tells him to do so. “If this were allowed to go like that we will have chaos because no one respects the Speaker’s ruling anymore and we could do as we wish,” he said questioning the purpose of legislators here. “So Mr. Edgill must know, the PPP must know that the Speaker’s ruling must be obeyed and they can stay there for as long as they want but it has to be obeyed, that is the Speaker’s ruling,” Joseph said, accusing the Opposition of adopting a pattern that was highlighted when President David Granger addressed the National assembly earlier this year. “The Speaker came subsequently and made a written ruling on their behaviour. So what you seeing here is a pattern that is continuing and I believe we have to take a stand and I believe the Speaker has done the right thing in taking a stand on this matter”. Jagdeo said he had made certain recommendations to the Speaker including the possibility of adjourning the session for today “until tomorrow so that we can diffuse the entire situation. “I pointed out to him about the frustration on our side in relation to the constant attempt of the government to avoid scrutiny. Now, consideration of the Estimates is provided for by the Standing Orders (and) could take as much as seven days. They have reduced it to five days although we are dealing with a budget that is over GUY$265 billion (One Guyana dollar=US$0.004 cents”. Jagdeo said that the fiscal package “keeps getting larger yet the time for consideration of the Estimates is being shortened. “And so we pointed out about this restriction, the need for Members of Parliament to do their duty that is to question the Estimates. We already know that these Estimates are not accurate and most likely illegal and they should be withdrawn because they do not reflect the 18 or 20 million dollar signing bonus that this government collected from ExxonMobil which should have been in the Consolidated Fund. Jagdeo said he had informed the Speaker that the issue “has gone beyond his ruling on whether Edgill should remain in the Chamber or not”. He said “subsequent actions of the agents of the parliament have led to the police coming here and the assault on our members of the parliament.